Negi goes off and attacks Gödel as the imagery of the attack on Negi’s village continues to play all around him, Nodoka, Asakura, Chisame, and Sayo (in doll form). Nodoka, who’s been monitoring Negi’s thoughts via her artifact, sees that the Magia Erebea is taking over Negi. Indeed, Negi begins to transform into a dark, demon-like beast form which impresses Gödel. Gödel encourages Negi to take out his revenge. Nodoka and Asakura grab Negi to keep him from attacking Gödel again as Chisame, in child form, slaps Negi hard in the face, bringing him back to reality. At the same time in the background, the imagery of Nagi saving young Negi plays out with Nagi killing the demons. An obviously injured Gödel applauds the efforts of the girls to control Negi from going out of control as Gödel’s death would have served his purpose. Asakura asks what that purpose is. Back on Earth, Eva, Chachazero, Al, Eishun, and Chachamaru-dashi (dash) discuss the Megalomesembrian Council’s decision to wipe out Negi’s village. Chachamaru-dashi asks why since the government is tied with Mahora Academy. Chachazero states that they did it for fun. Eva states that it was done as some of the people on the Magic World don’t seen Negi as the son of the Thousand Master, Nagi, but rather the son of the Queen of Calamity, Arika. Al says that Eva pretty much has it right. Thoughts/Review: The replay of Nagi saving Negi all those years ago reminded me that when Nagi slew the one demon by basically breaking its neck, just before that happened, the demon was awed by Nagi’s power but asked which of the two of them was truly the monster. I mention this because in 264, Negi’s uppercut was identical to Nagi’s uppercut, showing “life father, like son.” Here, the irony is that while Nagi used incredible power to wipe out the attackers, he obviously didn’t transform but was called a monster. Negi, on the other hand, used incredible power but literally did become a monster for a short time. Akamatsu-sensei didn’t display the scene of Nagi killing that demon (showing other aspects instead), but the irony of the entire scene wasn’t lost on me. The further reason for Negi’s choice of Nodoka, Konoka, and Chisame is clear. Obviously Negi expected a trap and showed great wisdom in knowing that he likely wouldn’t be able to control himself in a face-to-face meeting with Gödel. That was proven in their first encounter. What Negi needed was information, which he gets from Nodoka and Asakura. However, he didn’t have Nodoka monitor Gödel but instead monitor himself so that Nodoka could sound an alarm if Negi began going south. It didn’t quite go down like that with Gödel’s instant taunting and goading but Nodoka was able to see the shift in her diary pages which caused the girls to act. Chisame’s presence is obviously the catalyst to bring Negi back to Earth. Still, I think it is interesting that Negi chose her over Shiori-Asuna. It may be nothing more than Negi wanted to make sure Asuna didn’t get kidnapped, but in the back of my mind (and I believe I’ve seen it expressed in comments on the blog), I can’t help but wonder if Negi knows that the Asuna with him isn’t the real one and thus would be of no help with Gödel. Chisame then becomes the next logical choice to act as a restraint on Negi. I don’t know if Akamatsu-sensei will have more story told from Al’s tea party or not, but I’m curious as to what additional information Al has. Regardless, I’m still wondering about the order to attack Negi’s village. Considering the detailed records of the government and their having to know were mages lived on Earth, if Negi were the ultimate target, then why not attack him sooner? It doesn’t seem that he was exactly hidden, was he? When we first start learning of Negi’s past, everyone knows him to be Nagi’s son. No one speaks of Negi’s mother though, which is something I’ve always considered strange and a contributing factor in my initially theorizing that Nagi became Negi to hide in plain sight. Heck, Negi doesn’t even speak of his mother. So, the implication is that the attack on Negi’s village is to get the son of Arika, who’s officially dead and officially died years BEFORE Negi would have been born. So, for Arika to officially be dead and for some in the government to attack Negi’s village because the son of Arika was there says that they somehow knew Arika wasn’t dead and somehow knew that she gave birth to a son, then abandoned said son. It would mean that she and Nagi trusted a small village of mages to protect Negi while they were off doing other things under the supposed guise of being dead (Nagi supposedly dying just before Negi’s birth as well). Yet how would the government know that Negi’s mother was Arika and not be able to find her? One way the government might know is that if they knew for sure that Arika in fact never died but to quell the fears of the population, they stated she did die. Since Arika doesn’t appear to have been around when Eva traveled with Ala Rubra, one wonders where she was hiding since under this theory, the government would have to be keeping close watch on Nagi’s activities. Thus for Nagi and Arika to spawn a child, they’d have to do it without giving up Arika’s location to the government since the government wanted her dead. Plus, a few months after fertilizing Arika, Nagi is himself caught up in an incident of some sort and believed to be dead as a result. It just doesn’t make sense to me to attack Negi’s village when the government did. If Negi was indeed the target, I still ask, “Why not attack him earlier? Why not try to take him out later?” Graf Herrman, who was part of the original attack, was brought back to take on Negi and that might be the government’s second attempt on Negi’s life (and to possibly flush out Nagi or Arika) but if so, they failed as the Graf seemed to have his own agenda. Plus, the goal set out by Graf Herrman seemed to be to keep Negi out of the way for a short time (on top of testing Negi), which I’d always assumed was to allow Chao’s plan to carry forward unobstructed but who knows if that’s right or not. Well, I’ve rambled on enough here and hopefully we do get a few answers in the next chapter. A lot of action this chapter, but more interesting to me was the tidbits of new information regarding the attack that started it all. « Thanks For an Incredible Month! We know from Chapter 177 the diary can be used as 4 notebooks rather than a single diary, so a capability of being split into 2 rather than 4 should be possible. The main problems with this theory that I can find is that I cant recall seeing another diary near Nodoka and the Negi diary seems to be full size. I do think that Negi would want both his and Gödel’s thoughts monitered though as Gödel has not appeared to be that trustworthy in his appearnces to date. Huh? Where’d you get this scanlation? Couldn’t find it yet…Probably because that crackdown on mangahelpers a while ago. Well, I’ve read the raw and translation, so…. I really liked this chapter. I have a soft spot for good guys getting some kind of power that makes/seems evil (i.e. bleach hollow form). Another reason for chosing Chisame above Asuna: Chisame witnessed how Negi gained the Magica Ereba! She knows the pain he had to endure! @Mister_Random — Had there been another diary shown, then yeah I’d agree. That said, Asakura’s artifact was shown last chapter but I didn’t notice it this chapter. So it is always possible, but I think that the concern wasn’t so much Gödel’s thoughts but rather making sure Negi didn’t get lost. Now, with chapter 264, I was with you that Nodoka should be monitoring Gödel. Seeing the artifact active, Gödel may have thought so as well and thus spoke the truth. It is also possible that Nodoka did monitor Gödel. We don’t know a lot about her two acquired artifacts where she can read thoughts without having to see the diary. So maybe she had a direct feed from Gödel and a book feed from Negi. Asakura is one of the kidders of the battle harem so for her to be genuinely angry says something to me. @mastermack0 — I gather that the entire government isn’t down with Fate’s plan. The three government officials who supported Negi during the tournament would be proof of that (unless one of them is a traitor). @Doc — good point on Chisame. Plus, who knows, maybe Godel can block Nodoka’s artifact. I mean, he intercepted real-time telepathy, which seemed to be a shocker for Seras. Kind of unlikely, since even Fate seemed unable to block it. Going back to the Nodoka diary issue, IIRC Nodoka has used the earpiece in conjuction with the diary to moniter multiple peoples minds (when testing out the forbidden combo and bounty hunter attack) and the diary was not visible when she used it to read the minds of the bounty hunters. However I cant seem to spot the headset in any of the pictures of Nodoka in the last few chapters suggesting she is not using it though it could just be hidden behind her hair. She’s wanted by the Magic World for crimes against them. In my mind, she wouldn’t be wanted by them unless she had been to that world. Second, she’s a mage. She wasn’t a mage when she became a vampire but in the course of learning all that could be learned when it came to combat, she learned magic. While she could learn this on Earth, what better place to learn it than MM. Third, her scrolls are on MM and in the hands of Ala Rubra members or allies. Forth, Jack Rakan knew Eva. I find no evidence yet to suggest that Jack has ever left MM to be on Earth. If that’s the case, he could only have known Eva from her being on that world. In her present condition, Eva cannot go to MM because she’s curse, just as Al cannot leave the confines under the library. Prior to the curse, I see nothing that would prevent Eva from traveling there once she learned of it. You can read Japanese fluently, ANB? My Japanese is exceedingly mediocre. You’ve got an unfair advantage! :p I only got maybe a third of the Japanese right when trying to read the raw myself (and I had to cheat using my kanji dictionary!). Anywho, Enigma finally released ch 265 earlier this evening. Great chapter. Ending on a better note than I thought. 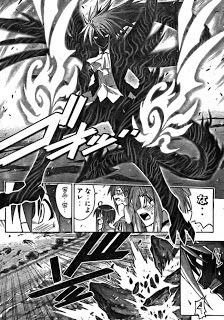 Negi never got to use his demon form. Godel still got a good thrashing, though. Nodoka’s diary showing Negi’s dark thoughts was really creepy (“Don’t forgive! KILL THEM!” in English *shudder*). Looks like we’ll finally see Godel spill next chapter. Kazumi’s gotta record this with her artifact (and that look on her face at the end? Yow! She’s pissed!). Hopefully we’ll get a good chunk of relevant plot resolved. Well, I had some other stuff I wanted to say, but I’ve got to finish packing my stuff as I’m moving in the morning. I’ll get back with you if I remember to do so. And congrats on the successful September. Awesome chapter is an awesome chapter! After seeing this chapter, I’m now more convinced that Nagi isn’t Negi, and it’ll be easier now to follow the true mystery to the attack on Negi’s village. Like ANB pointed, it might have been to flush Nagi out (which obviously failed). The simple ‘why’ seems to be the hatred that Megalomesembria has for Arika, but the deeper why is yet to be told. Though Tosaka says, from his experience, that Arika isn’t as horrible as she’s portrayed, its not the first time information has been concealed to the public. I even find it interesting that Megalomesembria is also part of Mahora’s system. It’s quite possible that Ala Rubra is helping the good side of Megalo (Mahora) defending it against the Godel’s side of Megalo. @Delta — Maybe if Negi totally lost it, the destruction of the world would be that much easier. I liked the part when his thoughts started blacking out, ending at KILL THEM. That was a very dramatic and nice touch that I think shows Negi’s struggle with Magic Erebrea more than has been shown in the past. I always thought it was strange that he got this “dangerous dark magic” and never really had any side effects. But now, we see, it’s slowly consuming him. All in all, I can’t wait until the next chapter comes out, when we can learn more about what happened. I’ve been looking back at the older volumes (1-3 specifically) and I’m amazed at how much more evolved the series has become. I mean, it was really good at first, but it’s developed in a way that I never would’ve expected if I had just read the first volume. I guess that’s just more to like about Akamatsu-sensei’s writing skills. I just thought it was interesting, especially considering some of the recent turns the story’s taken. That was Peter David’s mistake when he adapted volume 1 of the manga — he assumed this was some fluff comedy piece with magic when in fact Akamatsu-sensei was laying the groundwork from the start regarding Asuna and them moving on from there. The exploration of the library in volume 2 played later at the Mahora Festival and I believe will come into play again by the end of the Magic World arc. Volume 3 is where the manga became apparent to me that it wasn’t fluff.